Yesterday evening was a star-studded night for ABC, which aired the 41st Annual American Music Awards, comprising superstar artists like Taylor Swift, One Direction, Justin Timberlake, Lady Gaga, Rihanna, Miley Cyrus, Katy Perry and more. The three-hour event full of live performances, awards, speeches, sparkly wardrobes and the mingling of iconic, millionaire celebrities coincided with a monumental, historic, landmark accord between world powers to halt Iran’s nuclear program, and, in essence, prevent the entire world from dismantling into a state of chaos and decimation. When Katy Perry took the stage at approximately 8:15 p.m. to sing her single, “Unconditionally,” and millions of observers across the nation Tweeted their reaction to her vocal performance, somewhere — far away — President Barack Obama, Secretary of State John Kerry and Iranian Foreign Minister Mohammad Javad Zarif were sealing an international pact behind closed doors, potentially extending the lives of every person who lives in this world. And at 3 a.m. eastern time, when all of the night’s performances — including ones by Ariana Grande, Macklemore and Kendrick Lamar — were being illegally uploaded to YouTube, the world leaders signed off on the accord, which, for the first time in ages, may lead to a significant improvement in U.S.-Iran relations. Awards shows like the American Music Awards represent a goldmine for all those (…like me) who have a fascination with popular culture. Every major star, including all those named above — minus Obama, Kerry and the Iranian dude — are together in one room. I mean, numbers haven’t even gotten high enough yet to the point where you’d be able to compute their combined Twitter followers. Also, where else would you get to see Justin Timberlake and Taylor Swift not only cross paths, but join together to do the “surprised face” that Taylor has mastered so brilliantly? On a side note, Taylor took home four AMAs last night, and, for the record, she did not act surprised for any of them. But while all those shenanigans were going on, the aforementioned agreement to temporarily freeze Iran’s nuclear program was reached. Again, I’m not going to pretend like I know all about this, but when it comes to Iran, Americans naturally fear the worst. While they say they’ve been building up their nuclear program for “peaceful purposes,” we live in anxiety that one day, their president Hassan Rouhani will wake up on the wrong side of the bed and decide to nuke everything. Under the agreement, Iran cannot enrich its uranium supply greater than 5 percent, which is required to make bombs. In exchange, the U.S. will give Iran billions of dollars in sanction relief. While some politicians wanted harsher limitations on Iran’s nuclear program, this is reportedly designed to be a foundation for a more lucrative accord in the near future. But, let’s face it, nothing in those last two paragraphs is more interesting than a TLC reunion, featuring Lil’ Mama as the late Lisa “Left Eye” Lopes. People don’t want to think about nuclear war. Especially on a Sunday night. And why would they? It’s literally the worst case scenario that the world could ever come to. It’s much more enjoyable to watch ABC pan to an audience reaction shot of Taylor Swift to every single performance, or watch Lady Gaga collaborate with R. Kelly than to listen to a political analyst talk about Iran. But let’s all take a moment and acknowledge that, with this accord, nuclear war will likely not happen for at least another three to five years. That’s something worth celebrating, right? Or at least a small fist pump? But back to the AMAs. An interesting decision by the show’s producers was to have Miley Cyrus give the closing performance. You all already know my view towards Miley. I’ve lightened up on her a bit. She’s got talent, but it’s hidden under all her unnecessary theatrics. That being said, I thought this was an opportunity for her — once and for all — to silence her critics, and to deliver a poignant, solemn rendition of “Wrecking Ball” under a giant international microscope. No gimmicks. No funky outfits. Just singing. Though she listened to approximately one-third of those things by giving a stationary, heartfelt performance, she still chose to wear a sexually provocative outfit, and for some reason, have a giant, digital cat directly behind her, completely distracting the viewer from anything else that was happening. She still sung it well, and I’m not saying she blew it, but I thought she really could have taken better advantage of the grandiose opportunity. Oh well. Is it bad that this disappoints me more than the fact that we’re not heading for war? So people are using Throwback Thursday to gloat about their past now? Just when I thought people couldn’t possibly find anymore things to brag about on Facebook, in steps Throwback Thursday. Now before I continue, I must be careful where I go with this. Because Throwback Thursday is no longer a trend, or a meme. It’s not a cute little thing that people decided to do for brief period. It’s a become subculture. A way of life. People’s day-to-day lives have literally become so mundane that they not only anticipate Throwback Thursday, but have photos lined up for weeks in advance. My favorite is when somebody tries to act above it, and posts their retro photo with a caption, “I don’t normally do #tbt, but…”, or when they post that this is their “first #tbt ever” for the fourth straight week. But the bottom line is that people love it. When I scroll through Facebook and Instagram on Thursdays, I feel like I’ve transported to the mid-90s, since there is not one single present day photo there. It’s gotten to the point where old photos are so commonplace on Thursdays, that they don’t even need to be tagged anymore. In fact, people should start tagging their current photos that they post on Thursdays — since they are the minority — with a #pdp. Present Day Photo. But the problem, which I think people are now discovering, is that there’s only so many old photos. Initially, it wasn’t very difficult. You could just scroll through your Facebook timeline back to your college days a few years ago, and pick any old photo. This lasted a while, in fact. We all have a plethora of old photos, unless you’re one of those people who fear for their public image and deleted them all years ago. And don’t you regret losing all that #tbt material now, suckers?! However, even those photos run dry. You can’t keep posting the same drunk photos from college. So now, people are actually taking smartphone photos of old photographs, and posting them. That’s right — people are actually undergoing multiple steps to conform to #tbt. And that just opens Pandora’s Box. You have elementary school photos, family vacation photos, baby photos — people are pulling out all the stops just to scrounge out a few extra likes. But as is the case with all social media platforms, Throwback Thursday has evolved towards one fundamental goal: proving to your Facebook friends that your life is better than theirs. Normally, this is done by bragging about your job, workout regimen, social life, or checking in from some fancy restaurant or vacation spot. A picture is sometimes included. Now, with Throwback Thursday, people are actually bragging about their past. And don’t even get me started with baby or early childhood photos. That’s just desperation. So now we are not only trying to one-up each other regarding the current statuses of our lives, but also about the things we used to do. Is anyone really surprised though? I swear, there’s nothing in this world that humans will not try to make a competition out of. Again, I’m trying hard not to impose too much judgment, but rather, simply analyze what I believe Throwback Thursday has become. It is what it is, and seemingly, it’s here to stay. And feel free to check out my archive of past blogs to the right of this text! 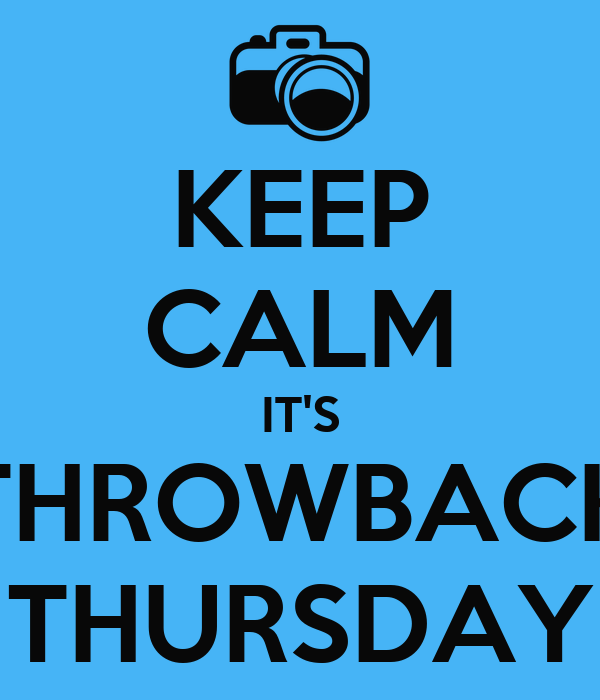 Throwback blogs, or #tbb, to keep you entertained for weeks. Or make you realize how much of your life you’ve wasted spending a few minutes per day with me. Has anyone ever taken a step back, and said, when’s the last time I found myself enjoying something that I discovered on the Internet? Maybe it’s just me being a gloomy, pessimistic sourpuss, but I feel like everything I see on social media makes me shake my head. For instance, the last couple of days, people are bombarding my Newsfeed with a list of 10 things that they claim people do not know about them. I do not understand why people are doing this. The Internet is an amazing resource. Think of it as an online, interactive workshop. Instead of building something with wood and tools, we now have the ability to create amazing websites, games, apps and videos. Regardless, people choose to make hash tags. And twerk videos. And selfies. With the amount of people who use the Internet now — which is pretty everyone in the world who doesn’t live in Ethiopia or Zimbabwe — cool things should be invented by the minute. There’s no excuse otherwise. Furthermore, I thought the entire purpose of the world was to invent things so that it could to lead to other inventions. For example, the telegraph turned into the telephone, which led to cordless and cellular phones. A phonograph led to record and CD players, paving the way for portable media players. Seriously, I can’t remember the last time I saw something on my computer screen that actually made me say, “Wow, that’s cool.” It seems like nobody is even trying anymore. Luckily, as of yesterday, my faith has been restored. If you haven’t seen this “Like a Rolling Stone” interactive music video yet, then you need to watch it right now. Because it’s one of the coolest thing you’ll have experienced since the very first time you used AOL Instant Messenger. In summation, it’s a mini television screen that allows the user to flip through the channels. Each station has a show that one would normally see on television right now — The Price is Right, a variation of The Real Housewives, a tennis match, a History Channel documentary, a cooking and shopping channel. But in each “show,” the person on-screen is lip-synching the words to Bob Dylan’s most famous tune while it plays in the background. Regardless of what part of the song is playing on whichever channel, it will be sung. And it is amazing. 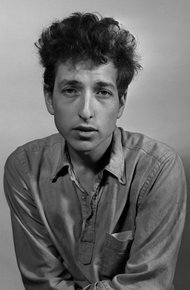 The video was produced by Dylan’s record label, Columbia, presumably with the influence of Dylan himself. It clearly wasn’t made without his knowledge, as it’s the main attraction on his own official website. Watching it for the entire six-minute length of the song almost, almost, makes up for all of the other crappy things that exist on the Internet. And it only stands to reason that something this cool, and innovative, was crafted not by a renowned inventor or a mega electronic company, but by Bob Dylan, who is as progressive a singer-song writer as our world has ever known. Bravo, Bob, for making the Internet cool again. People love to hate on politicians. They like to call them corrupt, stupid, misguided, evil, racist, liars — you name it. Every single person who has served as president of the United States has been called one of these things, if not all. It’s because we expect the smartest, wisest people to lead us. We worry enough about our own lives. We take care of the things we can control. And we leave it up to the best and the brightest to control everything else. So it stands to reason that we expect brilliant individuals to represent us as mayor, governor, senator and president. It really isn’t too much to ask. But nobody is perfect. That’s what we need to understand. Even the man I spoke about yesterday, John F. Kennedy, who is so often immortalized as a tragic hero who could do no wrong, had his flaws. So that’s the balance we need to all come to grips with. Although we should expect elected politicians to lead us to the best of their abilities, sometimes it’s accompanied by occasional mistakes and misjudgments. 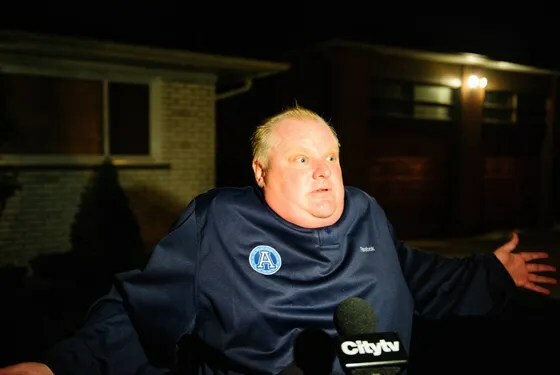 And then there’s Rob Ford, the mayor of Toronto. And pushes elderly female Councillors while in public session. And happens to look exactly like Chris Farley. Often, when Canada is compared to the United States, people like to say how they do things better than its neighbor to the south. It’s a country rarely plagued with controversy, and people just love to point out how their healthcare system is so much better than ours. And now we do. And his name is Rob Ford. Toronto voters elected Ford, 44, as their mayor on October 25, 2010. I’m not going to pretend I know a single thing about his policies, experience or world views, but I do know that there has never been another elected official who has served as a greater form of entertainment. I also do know that it is the obligation of elected officials to behave cordially in every circumstance, because how you are portrayed to the public is an important part of the job. Again, his policies might be outstanding, and he may actually know the key to ending all poverty and crime in the entire world. But as for the public image aspect, he could not be failing more miserably. And the best part is that we, as Americans, can laugh about it and not actually be affected in any way at the same time. People loved to mock George W. Bush, and his constant ability to embarrass himself in public. But while we were laughing, we were also silently crying, knowing that this man is our commander in chief. Well, Rob Ford is in another country. And what he does has zero impact on us. This guy would be funny if he was a comedian whose schtick was to go out in public and intentionally embarrass himself just to entertain others, a la Sasha Baron Cohen. But the fact that he is an actual mayor — who was elected by the public — makes it that much more glorious. Of course, it will probably end soon. In the last week, the Toronto City Council voted to reallocate some of his mayoral powers to Deputy Mayor Norm Kelly, and it’s only a matter of time until he is officially booted from office. But until then, America can all finally sit back, grab a cold beer, and laugh wholeheartedly at Canada for the first time since the South Park movie was released. Oh, and for good measure, here’s a clip of him falling down while pretending to play football. Friday will mark the 50th anniversary of one of history’s most important footnotes: the assassination of John. F Kennedy, our nation’s 35th president. At 12:30 p.m. in Dallas on Nov. 22, 1963, Kennedy was fatally shot while traveling in a motorcade alongside his wife, Jacqueline. Having not been born for another 24 years after this happened, I have absolutely no insight to offer into the significance of this day. However, I have heard on more than one occasion that this event represented a “loss of innocence” moment for our parents’ generation as 9/11 was to my generation. On Friday, when the milestone anniversary occurs, you can expect to hear a lot of commentary and articles by people reminiscing about this day, and trying to contextualize its significant within the history of the world. But, also, on Friday, you’re going to hear a lot of elderly people try to explain why the younger generation should care deeply about this. Unfortunately for them, another big event will occur on that very same day in America: The release of The Hunger Games: Catching Fire. I am not going to speculate right now, instead I am going to tell you that more people will care about this movie than they will the JFK assassination. And this is not a slight on the American people. I am not using this as a means to criticize our nation’s priorities, or lack of knowledge or interest in American history. I’m simply stating one fundamental truth: very, very few people have a great interest in things that happened more than 20 years before they were born. Are people interested in John F. Kennedy? No doubt. Throughout grade school, we were enlightened by our educators of the man’s mystique, his affability, his power to captivate any room during a speech. Even through a grainy, technicolor television screen, it was impossible for us not to be entranced, even charmed, by his eloquence. On top of that, the circumstances surrounding his death are enough to intrigue even the most tepid conspiracy theorists. We’ve all seen JFK. Come on, don’t tell me you still believe Lee Harvey Oswald acted alone. Don’t you dare. That all being said, John F. Kennedy and Jacqueline Kennedy Onassis will be overshadowed by Katniss Everdeen and Peeta Mellark on Friday. It will pain older Americans when they realize this. But just because something happened precisely 50 years ago to the day, it doesn’t mean the younger generation, who were born 20, 25, 30 years later, will suddenly care more. Ironically, the only impact the anniversary may have on younger people is that you will probably see #JFK trending nationally on Twitter — which, of course, older people won’t see. Because they still think Twitter is a type of candy bar. Although, it’ll probably be the second highest trending topic that day, behind, you guessed it — #HungerGames. Or #CatchingFire. Or #PostYourFavoriteSelfie. Let’s face it. In 2012, the first Hunger Games movie grossed $211 million worldwide during its mid-March release, becoming the highest grossing opening weekend ever for a movie not released during the summer or a holiday. And the sequel is only going to be bigger. Plus, the world has a giant love affair with Jennifer Lawrence. Especially males, after seeing her in yoga pants during Silver Linings Playbook. Google it. I hope the younger generation — including myself — will view the 50th anniversary as a time to respect and appreciate history, and maybe even do a slight bit of research about Kennedy, even if it’s for a minute. It never hurts to learn something. Even if it means reading his Wikipedia page while sitting in the theater during the coming attractions before Hunger Games.